A man is facing jail after he was found guilty of causing the death of a grandmother by driving dangerously on a north-east road. Car rental firm worker Alin Jar crashed into a Renault Megane while delivering a vehicle as part of his job. Jar was driving on the wrong side of the road when the tragedy happened on the A90 as he approached the Toll of Birness junction. He forced one car to mount the verge in order to avoid a collison then hit the vehicle travelling behind. Driver Amanda Todd was left permanently injured and her 57-year-old mother, Jamesina Stewart, who was sitting in the back seat, was killed. 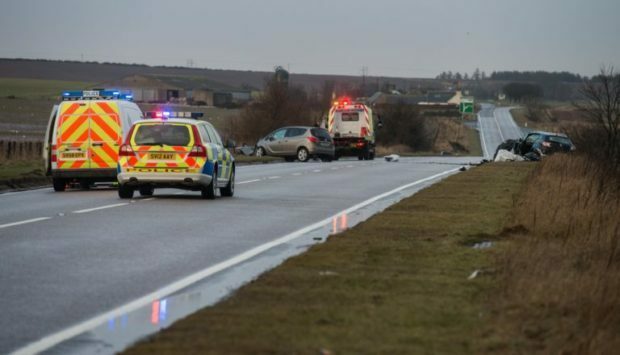 The family had been enjoying a Mother’s Day weekend trip to the Happy Plant Garden Centre in Mintlaw and were heading towards Ellon at the time of the tragedy. During the trial, Mrs Todd told the jury that Jar came “two-thirds of the way” on to her side of the road in the Vauxhall Meriva and, as well as killing her mother, the crash had left her with permanent scarring on her leg. But Jar said he had no memory of the incident on March 5, 2016 and denied the offence. He admitted the lesser charge of causing death by careless driving but this was not accepted by the Crown. Yesterday, following a five day trial, the jury of nine women and six men took just over two hours to find Jar guilty of driving dangerously. The 31-year-old was also accused of driving at excessive speeds and under the influence of morphine however these parts of the charge were removed by the jury. Following the jury’s unanimous verdict, advocate depute Bernard Ablett revealed the devastating crime was not Jar’s first motoring offence. He said he was first convicted of speeding at 72mph in a 60mph limit on June 7, 2014 between Keith and Huntly and was given three penalty points. Jar’s defence counsel David Moggach asked for sentence to be deferred to allow for background reports to be prepared. Lord Woolman granted this request and remanded Jar, of Clifton Road in Aberdeen, in custody. Ms Stewart, who had recently moved to Elgin with her partner, was pronounced dead at the scene. Jar will be sentenced at the High Court in Glasgow in June.